Revival title of Xiaolin Showdown that premiered in August of 2013. Unlike the WB produced predecessor, this series is a collaboration from American and French companies, ActionFliks Media Corp and Genao Productions and aired on Disney XD. At the Xiaolin Temple, four teenagers (well, three and one child)  Omi, Raimundo, Kimiko, and Clay  are chosen to become the next Xiaolin Dragons. In addition to their martial arts training and other monk duties, the team is tasked with finding the mystical artifacts known as Shen Gong Wu. Created by Grand Master Dashi, the temples original founder, these artifacts balance the forces of good and evil. Upon reaching the rank of Shoku Warriors, the monks are joined by a new member, Ping Pong  the Dragon of Wood. Together, the quintet strives to become full-fledged Xiaolin Dragons, protecting both the world and the Shen Gong Wu. Unfortunately this comes into direct conflict with the gallery of villains, who want to use Shen Gong Wu to take over the world. This includes Jack Spicer, the self-proclaimed evil genius whos a master of robotics and technology. Wuya, an ancient Heylin witch defeated by Grand Master Dashi and turned into a mere ghost in consequence. Lastly, Chase Young, an immortal villain who with the help his partner Shadow, wants to mold the world into his own liking. The series concluded in July of 2015, despite the announcement of a second season. 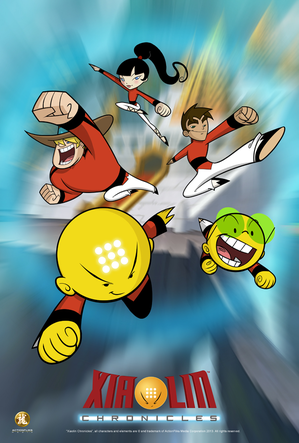 In a published newsletter  , the creator stated that Xiaolin Chronicles will be a standalone series, and the franchise will continue in a new format similar to the original series. The character sheet is shared with its original series, so go there for information on the new characters. Jack Spicer had red eyes in the original series, which matched his primarily black color scheme. Here, his eyes are black while his color scheme adds yellow and brown into the mix. Dojo had green and yellow scales in the original series, which were then reversed in Chronicles. Chase Young has a noticeable greener tint with his hair where as the original series it was jet black and only had a single green highlight. His eye color was changed from amber to brown while his armor became mostly green and brown as well. Wuya had a brown complexion in the original series and was replaced with a considerably lighter skin tone in Chronicles, along with her hair being a lighter shade of red. Tubbimura's Chihuahua, Muffin Face, was a regular dog in the original show. Assuming the Chihuahua shown is the same dog, he seems to be more aggressive and tags along with Jack's evil crew. Le Mime from the original series was rather ambiguous when it came to being evil. In this version, he's a lot more villainous and could take on the monks with far more dangerous miming. Alternate Continuity: Initially, when the show first premiered there was confusion whether it was a sequel to the original series, albeit with several differences. As the show progressed however, the continuities of both shows began to diverge rather quickly and then split altogether by the season finale. It was later declared a standalone series with later supplemental material. The preface for the special edition of Chronicles makes the distinction of Dashi being the Xiaolin Dragon after unlocking the secrets of supreme martial arts, also calling him "a force of light". Likewise, Wuya is an evil witch that stole Dashis secrets and became "the embodiment of darkness", the Heylin Dragon. Following the battle between them, Dashi sealed Wuya into a spring and then placed that into a puzzle box. Dashi created the Shen Gong Wu after defeating Wuya, whereas the original series he presumably created them beforehand. Furthermore, each new generation of Xiaolin Dragons that arrive at the temple eventually create new Shen Gong Wu themselves. The season finale reveals that in order to create new Shen Gong Wu, Xiaolin Dragons must give up their powers first. The season finale also reveals that with every new generation, Xiaolin Dragons could become Xiaolin Dragon Riders. The process included bonding with a respective dragon that would choose who was worthy enough to ride. This, combined with the fact that he would have to give up his powers, is what prompted Chase Young to switch over to the Heylin side. Art Evolution: In some areas, the art style of has improved over the original series with more attention to detail, one example being the Xiaolin Temple depicted a lot more architectural features and a permanent location. The character designs for everyone (sans Omi) have gone through a significant redesign from their original ones. Art Shift: Almost all the Xiaolin Showdowns are presented in CGI, complete with a transition from traditional animation to 3D. The sole exception is the showdown in "Mi Temple, Mi Casa", which is animated in the traditional manner. Audience Surrogate: Jack finds Chase and Shadow's continuous flirting to be gross, much like the audience would upon learning the former's paternity. Another example would be Kimiko expressing her disgust with the constant gross out humor (i.e. Dojo's flare ups and etc). Bad Future: In "Planet of the Dragons", the monks visit a future where dragons rule the world and humans are their slaves, because they mistreated Dojo who then went onto lead the dragons in the takeover. However, it's later revealed it was his descendant who pushed the takeover, as Dojo just wanted dragons and humans to be equal. Chase Young acts as the primary villain for the show, with his initial scheme being to bring down the Xiaolin Temple and bring rise of the Heylin side. This eventually changes to him wanting to destroy the universe in the season finale. Wuya primary goal throughout the show to regain her corporal form, which results in several plans that fail in part of Jack Spicer's incompetence. However, there are several hints that she is planning something in the long run, and with her confrontation with Princess Kaila in the season finale implies a force to be reckon with. Big Brother Instinct: Clay, to the other monks and then his younger brother Patrick, despite having a strained relationship with the latter. Breather Episode: "Buddy Blue Ray and the Golden Bunnies" is a lighthearted episode from start to finish, though with everyone present is lacking a bit of competence and foresight. This comes on the heels of the previous episode, where all the Shen Gong Wu are stolen and the Xiaolin Temple is destroyed by Chase Young. Butterfly Effect: Chase Young's evil scheme in "Laws of Nature" involves him using the Tiger Shrimp, a long-lost mystical creature that holds the key to unlock the missing link to the ecological chain. When used properly, it could severely disrupt the ecological order and in some cases, erases species out of existence. The Chosen One: While all five were chosen to become Xiaolin Dragons, Omi is only one that frequently refers to himself as "the Chosen One" as though the others don't matter. Color-Coded Characters: When participating in showdowns, the monks have a specific color associated them: Omi is cyan, Raimundo is blue, Kimiko is pink, Clay is orange, and Ping Pong is green. Color-Coded Elements: As seen in the monks' attack sequences: Water (blue), Wind (cyan), Fire (red), Earth (gold), and Wood (green). This differs slightly from their showdown color scheme. Combination Attack: Shoku Star/Rocket Formation, which is seen at the beginning of "Laws of Nature" and "Heylin Within". This allows the monks to fight in unison, though has never been shown to its full extent. Due to making poor financial decisions (which included purchasing a $6,000 toilet), Jack Spicer tries several times to gather up some capital. His failed plan in "Buddy Blue Ray and the Golden Bunnies" would've involved melting the titular bunnies down for their gold so he could rebuild his Jack-Bot army. In "Magic Stallion and the Wild Wild West", he collaborates with PandaBubba to get paid and put his scheme in motion. Jack ends up making considerable and legitimate money in "Xiaolin Redemption". He presents himself as an IT/Geek Squad venture and helps people with their computer issues. Though he does take offense to Wuya saying he's better at being an entrepreneur than being evil. He is also shown renting out his expensive toilet for customers in "Mi Temple, Mi Casa". Death Course: The first time the monks are shown in "New Monk on the Block" they are running the obstacle course. Said obstacle course includes features such as Omi evading arrows being shot at him, Kimiko hoping over a pit filled with mechanical crocodiles snapping at her, and Raimundo dodging giant shuriken with his wind element. Raimundo was a major character in the original series, with multiple episodes devoted to his character development, and concluded with him becoming the leader of the monks. His presence is considerably smaller in this show where he's neither of the aforementioned and is largely in the background with his fellow teammate Clay, whose presence was minimal to begin with. In addition to the main villains, the original series also had a recurring gallery of minor ones that would either team up with the former or contest with the monks themselves. Of that gallery, only Tubbimura, Katnappe, PandaBubba, and the Cyclops appear. Aside from PandaBubba having a major role in "Magic Stallion and the Wild Wild West", all of them are usually the voiceless and part the of background. Downer Beginning: The three-part series premiere concludes with aptly named "The Fall of Xiaolin", with Shadow stealing all the Shen Gong Wu and the Xiaolin Temple being destroyed by Chase Young. In consequence, Master Fung leaves the monks to for an enigmatic journey while they start a quest to find a new temple. Dude, Where's My Respect? : At times, Dojo feels though the monks don't give him enough credit for all the things he does for them. This ends up being the underlying issue in both "Planet of the Dragons" and "Heal Me" though in the latter it's mostly directed towards Omi. Duels Decide Everything: As with the original series, Xiaolin Showdowns are the solution to the episode's conflict when suitable. A particularly dramatic case happens in "Princess Kaila of the Thousand Layer Mountain" where Omi defeating Chase Young in a showdown was the only way he could save the other monks from being permanently transformed into jungle cats. Evil Gloating: Jack Spicer loves to gloat about his latest evil scheme and inventions. Likewise, Chase Young gloats a lot more than he did in the original series. Evil Sounds Deep: In the original series, Chase Young was voiced by Jason Marsden and sounded rather youthful. With David Kaye now voicing him, he sounds noticeably deeper, which makes it great for all the constant scheming he does throughout the show. Exposed to the Elements: The monks are shown running about through ice and snow in "Heylin Within" and "Omi Saves the Holidays" in their monk robes without any qualms about the freezing conditions. This is strange, considering they wore winter clothes at the beginning of "Heal Me" as fitted. Omi already had a problem with haughtiness and being self-centered in the original series, but this was counterbalanced with more positive traits such as deep appreciation for his friends and seeing the good in everyone, to name two examples. In this show however, his attitude is even worse, combined with the tendency of being envious of anyone being more accomplished than him. Dojo in the original series would react differently when a new Shen Gong Wu revealed itself; some of them would be humorous like he sneeze he couldn't get rid of, others would be a bit more serious, such as getting rashes. Here, when a Shen Gong Wu revealed, no matter what he would rapidly break out in boils that pop then spew pus all other the place. In the original series, Master Fung and Dojo's relationship was rather close, albeit the latter becoming increasingly possessive towards the former near the series end. In this show, Dojo seems to be outright and obsessively in love with Master Fung, to the point where he breaks down emotionally whenever the two are separated. Omi and Ping Pong; where as Ping Pong is humble, kind, and considerate of others, Omi is selfish and egotistical with a jealous streak of anyone being more accomplished than him. At the same time, Omi is assertive and stands his ground, Ping Pong tends to be a people pleaser and a pushover at times, particularly seen in "Heylin Within". Clay and Patrick; while they're both huge and muscular cowboys, Patrick is hot-blooded, stubborn, and can be boisterous (especially when in his superhero persona), Clay is calm, quiet, and reasonable. At the same time, Patrick tends to jump into situations without foresight, whereas Clay would at least plan ahead of time. Shadow and Chase have flirted several times throughout the series, with the former even making a few innuendos while latter has seen her as a romantic partner. This is all done with both aware that they're father and daughter as revealed in "Laws of Nature". In "Out of Ping Pong's Mind", Jack express disgust after spying on Chase and Shadow communicating face-to-face by hissing. Wuya then immediately tries to do the same with Jack and even follows him into his fancy toilet when he tries to run away, saying, "Ooh la la, what big... hands. "note A guy having big hands/feet is a old truism that supposedly indicates that he's well-hung. In "Buddy Blue Ray and the Golden Bunnies", Jack Spicer gives Dojo a doll fashioned to be Master Fung. The left eye is larger than the right, glows red, and then moves around because its a camera. Then it's revealed there's a tracking device sticking out of the doll's rear, which no one had noticed until Kimiko flips it upside down. In "Back in the Flesh Again", Jack Spicer gives Omi a bow tie in order to participate in the talent show. Said bow tie is obviously a hidden camera, complete with the whirring sound to zoom in. Of course, no one notices it until Kimiko takes a closer look after the Shen Gong Wu vault was broken into (again). Keet: Ping-Pong. In fact, his hyperactive all-over-the-place demeanor is what earns him his nickname. Limited Wardrobe: In the original series, the main characters (beside Chase Young and Omi) would have several outfits to wear, depending on the setting or situation. Kimiko in particular would have a new and different outfit per episode. In this show, everyone's wardrobe has been reduced to two outfits at the most, with Kimiko's being temple robes and then a skirt. The Mole: Chase sends Shadow to infiltrate the Xiaolin Temple under the disguise of a new student named Willow. She manages to succeed over the course of three episodes. Mundane Utility: Kimiko uses the Medusa Comb and her element to change hairstyles at the beginning of "Toyko Madness". Later on the monks use their new elemental Shen Gong Wu to clean up their new temple at the beginning of "Mi Temple, Mi Casa". Dojo believed Wuya was trapped in a puzzle box as opposed to a spring following her defeat by Dashi in "New Monk on the Block". In the original series, she was indeed trapped in a puzzle box. Dojo's future descendant in "Planet of the Dragons" has almost the same color scheme he had in the original series. Likewise, Rocco from "Rocco" sports almost the same colors well, albeit darker. Ocular Gushers: Dojo has broken down several times into weeping fits, mostly because he is separated from Master Fung. Jack has wept in a similar manner (complete with running mascara) in "Tokyo Madness" when Kimiko changed his hairstyle to pig tails and then a queue. Omniglot: Ping Pong knows several languages, no part in consequence of being a pan-European delivery boy. A keen ear can hear him switching between French and Spanish the most when excited. Only Known By His Nickname: Boris Antonio Rolf Jean-Pierre Gaulle LeGrand IV was dubbed "Ping Pong" by Omi due to his hyperactive debut. Out-of-Character Moment: In "The Fall of Xiaolin", Chase Young suddenly appears and then announces his participation in the showdown between Willow and Jack, wagering his 'good looks'. He then soundly defeated by the former during the showdown almost too well. The monks later realize its a clue that Willow is in cahoots with Chase. Peek-a-Bangs: Shadow has one eye covered by hair when disguised as Willow. Clay and Patrick have one eye covered by hair as well, though it occasionally overlaps with Blinding Bangs. Reality Warper: In the original series, showdowns would alter the landscape to fit the showdown's respective theme and non-participants could comment on the ensuing match. In this show, the showdowns are treated like a pocket dimension that contestants are seemingly warped into by Dojo. They also focus solely focus on the contestants and non-participants are unable to watch or comment on them. Series Continuity Error: The monks have all their Shen Gong Wu stolen by Chase Young and Shadow in "The Fall of Xiaolin". Come the next episode however, Clay is shown using the Fist of the Iron Bear and Omi wagers the Shroud of Monster Camo in a showdown  despite the fact that both are technically in the aforementioned villains' possession. Soon enough, more stolen Wu start appearing in the monks' possession without any explanation on how they managed to get them back. Ship Tease: Shadow and Chase flirt several times despite knowing they're related to each other. Raimundo seems to be interested in Kimiko, just like in the original series, and in "Xiaolin Redemption", Wuya implies a sort of relationship with Salvador Cumo. There's also the brief moment where Shadow (disguised as Willow) flirted with Clay during "A Girl Named Willow". Specs of Awesome: Ping Pong wears light green-tinted glasses and is an excellent fighter like his role model Omi, if not better. Jack wears glasses during his IT/Geek Squad venture in "Xiaolin Redemption". Time Skip: It's implied several years have passed within the show, as the main cast (sans Ping Pong) are familiar with each other and worked together previously (Jack and Wuya). In "Back in the Flesh Again", Omi states it'll be his fifth consecutive win at the temple's annual talent show, meaning five years have almost passed. Dojo is able to breathe fire more easily and managed to tie with Chase's fire breath. If not for Shadow's interference, the fire fight between the two could've gone either way. Le Mime was, for a starter/one-shot villain, decently powerful in the original show, but here in Chronicles, it's a whole other story, his powers are more combat-oriented and don't have the weaknesses they did in the original show. Added to that, he's capable of easily defeating the monks this time around, and if it wasn't for the episode's Shen Gong Wu, he just might have won. Tron Lines: The outfits the characters wear in the Showdowns glow, usually with lines or the most notable aspect (Omi's dots, Chase's armor spikes, or Jack's goggles, for example). Truly Single Parent: Chase to Shadow, who was created via magic. She even jokes that calling him "papa" would be weird, despite knowing. Unflinching Walk: Chase Young pulls off one of these in "The Fall of Xiaolin" - down a collapsing building. In episode 3, the temple is destroyed and Chase Young and Shadow have taken all of the Shen Gong Wu, with Master Fung taking a leave for a while. Episode 6, if only for giving us Shadow's origin. Despite being responsible for Chase Young turning to evil, being built up as the worst the Heylin side had to offer and being the main villain of season 3 of Showdown, the series hasn't seen hide nor hair of Hannibal Roy Bean. Whether he doesn't exist in this continuity or if he'll show up down the line isn't clear. On the subject of Hannibal, Chase's Start of Darkness in this continuity does seem to have involved some sort of malevolent, phantom-like being that brings Hannibal's armor from the original show to mind, but whether or not it is Hannibal is unknown, as Chase's backstory in Chronicles had him merely use the Lao Mang Long Soup provided by this being to achieve more power after he had already turned to evil. Writing Around Trademarks: Evidently the reason the names of some of the Shen Gong Wu were changed for Chronicles.